The westward flow of the Columbia River to the Pacific Ocean scores the boundary between the states of Oregon and Washington. It cuts through the heart of the Cascade Range creating a natural passage through the mountains known as the Columbia River Gorge. The river is busy with marine traffic for both business and pleasure. Both banks of the Columbia are lined with steel rails and the competition between the railroads is great. In part 1 of this two-part series, we covered Union Pacific's Portland Subdivision in Oregon, heading east to Hinkle Yard. Now let's return west along the BNSF and see the gorge from the Washington side of the river. We will begin at BNSF's hump yard at Pasco and head over 200 miles to Vancouver. You'll see heavy Powder River Basin coal trains, hot Z trains, garbage trains, manifests, Amtrak's Empire Builder, and a special visit from SP Daylight steam locomotive #4449. One breathtaking image opens after another as the photographic possibilities here are endless. 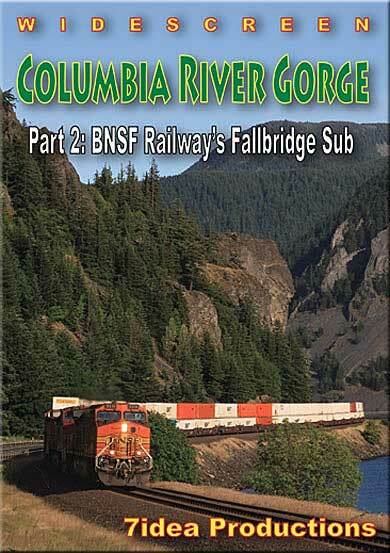 Join us for Columbia River Gorge Part 2: BNSF Railway's Fallbridge Subdivision. This program was shot between June 2011 and June 2012. Jim B (yakima, WA) on 2013-07-23 20:47:43. Really enjoyed the video as it is in our backyard, beautiful location. Hueycrewman (Dulacca, Qld., Australia) on 2012-09-30 16:07:25. I must admit to being a fan of 7idea productions. Even so, this documentary is well above the norm and sets a new standard for other producers. The clarity of the Bluray is incredible, especially when you consider how thrilled we were with VHS videos. 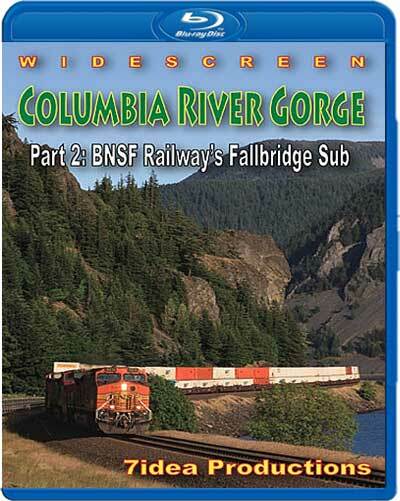 This Bluray/DVD gives a whole different view of what I consider the best rail fanning area of the US. I am more than happy with this production. Thank you 7Idea. gary vaughan (north Queensland, Australia.) on 2012-09-18 23:10:32. Excellent DVD,superb picture and sound quality in Blu-ray.Will definitely buy Blu-ray in the future. Great location,plenty of trains. Absolutely beautiful is the words that come to mind when watching this program. Every scene you can tell was studied and gives you that feel of personal presence. The action never slows and the area becomes intensely scenic over the course of the program. The narration is perfect and I love how details are given about the area being covered such as history and other operations going on. It holds your interest and the lock and dam procedure covered was a nice touch. I give this video 5 stars because it holds your interest throughout the film and gives you a wonderful tour of the gorge. On a side note, I noticed the program would freeze in certain areas of the program. I wonder if others had this issue, or if I might have a faulty disk. blacksash1 (St. Paul, MN) on 2013-02-18 10:53:53. I would really like to see the Cascade mountains, this DVD really does it for me. Besides the train action I enjoyed the river traffic and dams and locks. The mountainous scenery is awesome, the different types of ships and boats on the river is a very good fit at the time. I think it is a "must have" for people who like trains, boats, mountains, and rivers. Thanks very much.